Retia a.s. company from Pardubice, founded in 1993, is a leading Czech producer of world-class radar equipment and military electronic systems. The company was founded by a team of engineers and collaborators who worked for Tesla Pardubice, a world-famous company focusing on electronics. Its major projects within the domain of the military systems cover development, production and modernization of radars, command and control systems, and air defence missile systems. Based on a proven modernization of the KUB air defence system of the Czech Army by Retia the company now modernizes the KUBs for other customers. Two radar systems by Retia are available. The ReVISOR and the ReTWis. The ReVISOR is a radar surveillance system component focusing on combat airspace. The highly mobile system detects, identifies and quickly recovers information necessary to monitor air targets, and is mainly designed to support anti-aircraft systems of SHORAD/VSHORAD types. It is operated by the 25th Air Defence Missile Regiment. The ReTWis is a small portable radar detecting living entities behind a wall or another non-metallic barrier. The system can detect living entities both in motion and at rest, based on small changes suche as breathing. The device is suitable for multi-purpose usage, for special police and military units. 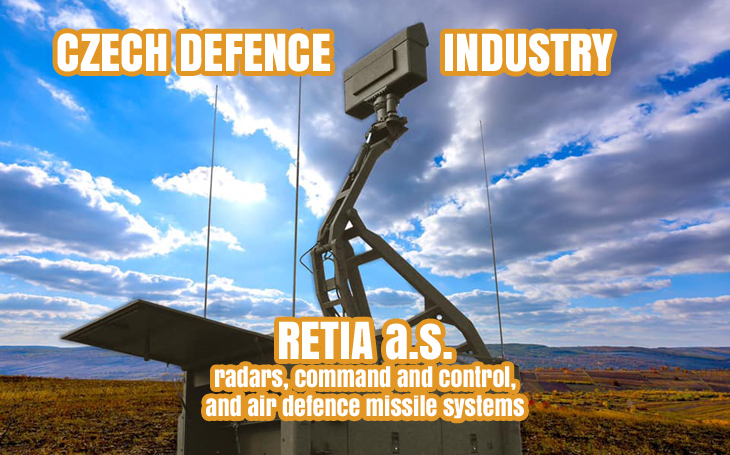 Among Retia’s products in the domain of command and control systems, there is the RACCOS, an automated mobile communication, information, command and control system used to control firing that can be operated by ground based air defence units at stations and during relocations. Its task is to provide superior, subordinate and cooperating units with information necessary for their activities, and to propose solutions which increase the efficiency of the anti-aircraft defence system.​ The SURN vehicle (the 1S91 radar vehicle within the 2K12 KUB system) of the Czech air defence was upgraded to SURN CZ standard especially by linking the 2K12 system with the RACCOS. The company also offers other command and control modules for the SHORAD and VSHORAD systems, an optical airspace observer, an optical system for recording and evaluation of shooting and data storage, and other systems. Based on many years of experience the company provides modernization of radar systems (P-18, P-19, P-37, ST-68 and more), ground rocket launchers (MLRS BM-21 GRAD and RM-70), R-934U radio jammer and specifically of the 2K12 KUB (SA-6) Surface-to-Air Missile system. The KUBs may be old, yet with uprgaded electronics and in combination with the original vehicle’s features such as mobility and endurance, the system is effective even today against the actual aircraft, and is operated by many countries worldwide. The modernization made the 2K12 system fully compatible with the NATO standards. Retia also provides replacement of the original 3M9ME /3M9M3E missile. Retia a.s. is part of the Czechoslovak Group holding, together with many other Czech defence industry companies that we will present in articles to come.